Sunset at the beautiful lighthouse at Bass Harbor, Maine, near Acadia National Park. PostChallenge Update: Thank you so much for the honor of a ribbon in this of all challenges! This image is certainly my favorite of the shots I took last year. This is a fantastic shot , the angle is brilliant , adding to favourites. This is so beautiful. The detail on the sky and the water on the bottom is perfect. excellent, def deserves the red if not blue! Absolutely gorgeous! I've been there and I'm not sure it looked this good in real life! I'd love a print. One of the best here IMO. How can this picture not be in everybodys list of favorites? This is stunning, breathtaking..... don't have words!!! New here and browsing - this is just stunning!! One of the nicest photos I've seen. Great picture--I was curious about whether you used a polarizing (or other) filter or otherwise did anything 'special' to obtain such outstanding results. Neil, I am just so impressed with this image, I cant tell you. Is it possible you could let me know which lens, at what length, what would the equivalent be in 35mm photography and is it straight from the camera, or what did you do to it? I have not got a digital slr, and dont seem to be able to get this sort of result, but I would love to get a big print of this. This is just amazingly beautiful! Congratulations! My ten was worthwhile. Congratulations on having the highest score with this lens! I remember this from somewhere and remember loving it! Congrats!! Congratulations! What a SUPERB Photoshop job! I'll add my congratulations and my "thanks for sharing this". It was indeed my favorite of a remarkable collection of favorites. WTG Neil. Congratulations on 2nd against so many wonderful entries. You should be very proud. Beautiful shot and it will be great that big hanging on your wall. Congratulations on a Huge Ribbon with this wonderful image so beautifully captured and presented. Excellent work!! Congratulations, Neil - this is such a beautiful shot. It was one of my 10's in the challenge. It's really fantastic. What an honor to get a ribbon in this challenge. Neil, Congratulations on this wonderful finish and great shot! Message edited by author 2006-02-01 18:23:54. Congrats, Neil. I didn't make it all the way through scoring this challenge, so I missed your shot. Well deserved ribbon for a beautiful shot! Fantastic photo, congratulations on your ribbon! Wow,Neil, congrats on the ribbon in the toughest challenge of the year. You should really get a ribbon with a star next to it for this challenge. Congrats Neil on your Red with this amazing and stunning image. I think I remember reading somewhere that you had to wade thru mud and muck or it was really cold to get this shot can't remember exactly but it sure paid off! This is a beautiful piece of art. Great job Neil... Congratulations on a wonderful shot!!! Congrats on the ribbon and your highest challenge score to date. Well done. I look at this and think, there is so much more i could be doing with my wide angle lens. An amazing display of subtle shadows and colors, a nice reprive from the supersaturations. Great image, well deserved ribbon ! Congrats ! straight out of a fairy tale....great image and post processing job! Congrats Neil, I had high hopes for this image and it didn't disappoint. Well done! Message edited by author 2006-02-01 03:53:45. Way to go Neil! Glad to see one of your images ribbon in the Best Of challenge! Awesome image with so much depth and colour. Congatulations on your win. 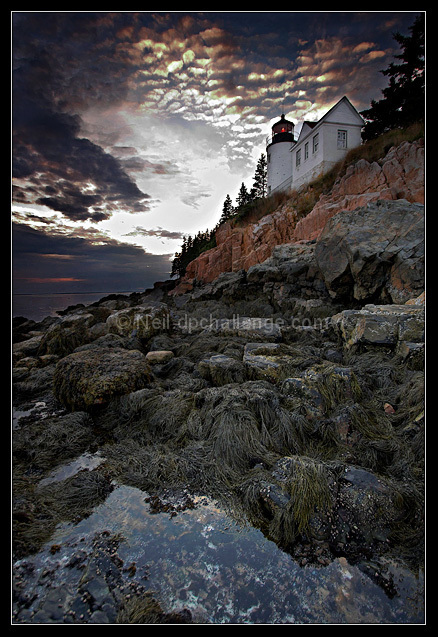 Whoa, from the thumbnail I saw on the main page and the title "Bass Harbor Light" beneath it, I saw a bass (fish) in your photo's thumbnail! I assume you didn't do this on purpose? The light in the photo appears to my eyes as a large fish. Great photo! Congratulations Neil, what a beautiful shot. This is AWESOME!!! I soooo not surprised that it ribboned. Congratulations! Neil, you dog! What a beauty. What a fairyland. WOW! Congratulations on your well earned RED in this hot challenge. What an awesome photograph! Congrats on the ribbon. How were you able to achieve such depth and contrast? Would love to hear it! Congratulations, wonderful range of tones, well deserved. Congrats on your ribbon! I knew this one would do extremely well. I knew it was yours, and i had a hunch it would ribbon. Well deserved! Congratulations on a great shot and a good year start! congrats, nicely done...way to go! well, neil, if you're gonna win, you might as well win big! congrats on a most deserved finish in a monster challenge! may 2006 be even better!! Neil!!!! WTG....Big huge congrats! WOnderful to see this win! I trade half my POTD's for it! congrats again! Congrats on the ribbon! Excellent photo, well deserved. I didn't get to this one in voting Neil...this RAWKS! Congrats! Powerful and stunning image. Perfect in every way. I love the dramatic effect of the clouds. Well done! fantastic in more than one way! 10, superb! added to my faves! What atmosphere! Mystic, straight out of a thrilller movie, this one must go way high in this challenge! Really like this image. So much to look at. Nice job. This is a picture/ postcard.....Just lovely. I think I have this in my fav's, so it's hard to justify anything but a 10+. Hope you get on the front page! I like this one. Interest is maintained foreground to background. Good light, too. Beautiful shot. Very mysterious sky. This would make a awesome print or painting. i like this. i think the red rocks and the sky are the most interesting part of the shot and i think a composition that focuses on those would work better. i'm not sure the tide pool and mossy rocks add that much to the scene. The sky is a bit over the top, but you've done a great job on the foreground. Very dramatic all in all! very nice angle love it. Beautiful! This looks like it should be a postcard or calendar! Very nice! Beautifully composed. You will score very well on this one. It will look great hanging on the wall. Beautiful shot. Well composed, and the light and colours are excellent. Lovely! Does the sky actually do that effect naturally? Very special image, nice tide pool detail, well done. I still love this Neil. I was hoping I'd run across this. I've already said it and I'll say it again...EXQUISITE! I'd give a 12 if I could. Oh heck, a 13. I usually give a bonus point for lighthouses. Great color, composition and photo! A great choice for the wide angle. The processing is a little bit hard for my tastes, but people tend to like it I've noticed. He... I already have this as a favorite. Compared to the one in your portfolio I find this version a tad oversharpened to my taste. Of course that doesn't distract from the overall greatness of the image. I believe this one is all ready in my favorites. That says it all, one of the best I've seen around here. Woow! Great lights, colours and surrounding! Tpp much software here,subject is cute but light is terrible. terrific wide angle ... creative balanced composition, great exposure and colors! Fascinating to watch the subtle changes you make in this one... Care to PM me and let me know how you're doing? As you know, I think it's a great shot. A great shot. this definitely belongs in the ribbons. Very effective style! Beautiful capture. This looks like it should be in a museum somewhere. Good luck. I believe I've commented on a similiar picture in your portfolio. Not much to say other than pure perfection. Just brilliant!!!! Message edited by author 2006-02-01 10:53:06. Beautiful shot. It evokes such emotion...just the right amount of colour. Very interesting landscape and perfect composition. Excellent photograph, very incredible composition. The sky and lighting are very good. "10" from me, good luck! I've got to learn how to make images like this! It's absolutely perfect on every level. Gorgeous. Such rich colors and such a striking, inviting composition. This is really, really beautiful. The lighting has been captured perfectly. I like the composition, but the sky seems overdone and out of place when compared to the ground. I really like the exposure and depth on the ground. When I give a photo a 10, it is because I feel it is wonderfual all the way around. Therefore, I have no real comment other than to say I gave you a 10! Surreal photo! The detail everywhere is great, and the exposure is spot on. Did you use multiple exposures from the same raw file for it? However it was done, it looks excellent! Proudly hosted by Sargasso Networks. Current Server Time: 04/22/2019 06:26:50 PM EDT.